Maximum wirelessly transmitted power at a distance of 30 cm between the coils L1 and L2 is 69W. 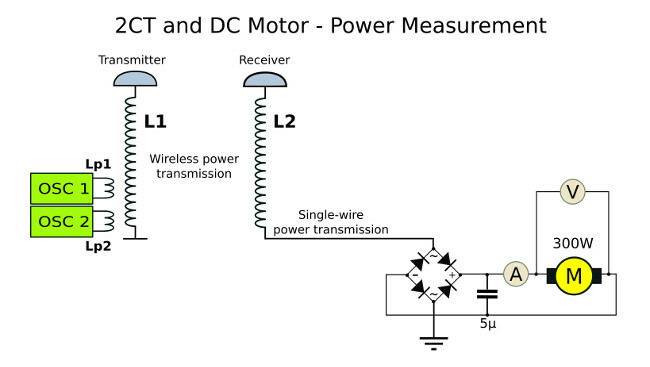 If the distance is increased to 70cm, then wirelessly transmitted power is 46W. The same measurements I performed with analogue instruments and got the same results. Measurements with analog devices have not demonstrated in this video. Hi, Thanks for these wonderful experiments. Wondering what was the input power consumption? Do you have the measurement result on this aswell. Hi, thank you for your support. Unfortunately for now I have no overunity. Energy consumption depends on the distance between the coils L1 and L2. The device consumes between 40% and 100% more power than the power consumed by the consumer (bulb or motor). What is especially interesting, is the largest consumption when near L1 no coils. Probably this energy is spent on radio wave radiation. When near the coil L1 is coil L2 consumption is significantly reduced. Currently optimized device – which will soon show. Just a idea. Why not point to point beamforming just like what a dish antenna has. In this way I will not waste power in radiation which is not captured by receiver. Good idea, but can not be used for this frequency (f = 700kHz). In addition it is a near field area.